Check AP 10th Class Results 2019 [Declaration Date] : AP SSC results 2019 will be announced on Andhra Pradesh Board of secondary education official website. As per latest news, results for SSC Annual (March -2019) examinations will be announced in the last week of April 2019. Candidates who will be appearing for AP SSC examinations to be conducted by Directorate of Government Examinations, Andhra Pradesh are required to know about SSC examination results. The Board of Secondary Education, Andhra Pradesh has already released the examination time table of ‘Secondary School Certificate Public Examinations, March, 2019’ for both regular and private students. To check or download examination time table, please click here. AP SSC examinations for the session 2018-2019 will be conducted from March 18 (Monday) to April 02 (Tuesday), 2019. After conducting the SSC examinations successfully, the AP SSC Board will evaluate examination copies then announce results. As soon as result announced, all the students who will appear in SSC 10th class examinations to be conducted in March-April 2019 can access their results through official result website. To check SSC 2019 results, candidates will have to use their hall ticket numbers. As soon as the results declared on official portal, we will update the same on our website too. 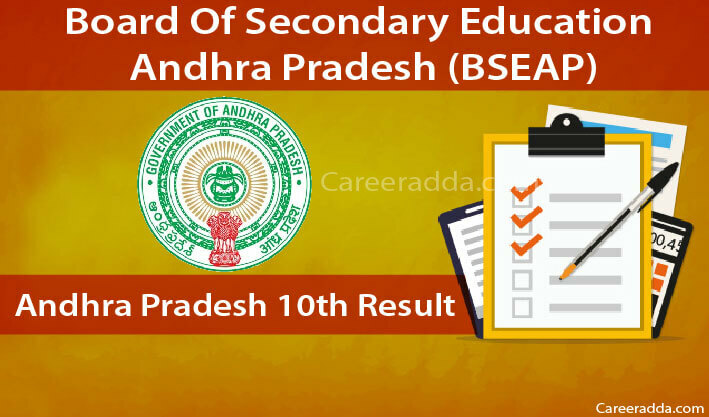 According to the latest media reports and confirmation from board, we have just got to know that, the Board of Secondary Education Andhra Pradesh (BSEAP) will announce SSC class 10th results on its official portal bse.ap.gov.in and on other websites in the last week of April 2019. Students can access their results, scorecard by name and roll number wise. For your convenience here we have provided procedure having few steps to check AP 10th Class Results 2019 quickly. It will be the foremost thing you have to do after fetching your result. Along with saving into computer, also print your result on A4 size paper. This printed copy of your AP SSC result 2019 will act as your provisional result until you get original result documents issued by the Board of Secondary Education of Andhra Pradesh. Generally, Board takes 40 to 50 days in issuing original result documents. After a month from the date of result declaration, a candidate can collect his/her original result documents from his/her school/college. After fetching your result, if you will see any sort of error in your result then immediately contact the authorities of your school. In such cases, school administrations help candidates in removing the error from their results. Error in your SSC result can be of any type. In addition to above mentioned method, students can also get their result on their mobile phone through their subscribed SMS or Mail ID. Procedures for the same are given below. Note: Both IVRS & SMS service to check AP SSC Results 2019 will be chargeable for candidates. AP SSC Board will announce class 10th results after checking the copies of candidates successfully. The process of evaluating the answer sheets shall be completed within 20 to 25 days from the date of last examination. Once evaluation of the answer sheets is done, the SSC Board will disclose results. Candidates who fail in qualifying SSC examinations 2019 will get an opportunity to appear in the supplementary exams. SSC supplementary examinations will be conducted by the same Board after few days from the date of SSC results announcement. To participate in the supplementary exams, candidates will have to fill and submit an application form along with the requisite fee. After conducting the supplementary exams, the SSC Board will release supplementary exam results in the month of June 2019. Andhra Pradesh Board’s SSC is a one year course that can be pursued after clearing class 9th examinations. Every year, the Board of Secondary Education of Andhra Pradesh conducts SSC main examinations at several examination centres across the state of Andhra Pradesh. This year’s AP SSC examinations will begin on March 18 [Monday] and end on April 02 [Tuesday], 2019. For timing of examinations, please refer to SSC time table. The Board of Secondary Education of Andhra Pradesh is also called as the Directorate of Government examinations. It was established in 1953 and functions as an autonomous body under the Andhra Pradesh Department of Education. The Board regulates and supervises the system of Secondary education in the state of Andhra Pradesh. It executes and governs various activities that include devising of courses of study, prescribing syllabus, conducting examinations, granting recognitions to schools and providing direction, support and leadership for all secondary educational institutions under its jurisdiction. The Government of Andhra Pradesh has taken a good step towards providing Secondary Education to every child in the state and formed a Directorate which is popularly known as S.S.C board. This Board takes the mere responsibility to conduct the examinations every year without fail. SSC Class X Examinations will be conducted in March of every year and the results will be released in May of the same year. Students who have appeared for the exams in 2019 have been waiting for the results. So Students, Stay relaxed and believe in your selves. Hope for a positive result. In general people consider the Class X exams very seriously as the grades travel along with us all through our career. So be confident about the results. Wish you all the best everyone. If you want to know more about the Board of Secondary Education of Andhra Pradesh then go to its official website or just click here www.bse.ap.gov.in . In last year’s SSC examinations, 6,13,370 students were appeared. Out of which 5,71,175 students were passed; 94.48% was overall passing percentage. For more previous years’ stats, please go through below given table. It is clearly noticed that no. of students appearing the exam has been increased year by year, so the pass percentage. When compared with the previous years, this year there is increase in number of students who got registered. Visit our website frequently to get updated news, every particular about the results. In the end, we just want to conclude this piece of writing by saying that if you will face any sort of issue in fetching your AP SSC result then immediately contact us. We will definitely help you in checking your result. If you want to know more about AP SSC Results 2019 or have any query then feel free to contact us. We wish you Best of Luck for your AP SSC Results 2019.